Enhancing classic fighting games just isn't as lucrative as it used to be, so Capcom is stepping away from that part of its business model. If you read my recent review of Darkstalkers Resurrection, you're well aware of how much I love Capcom's efforts to revive its 90s-era fighting games for modern technology. The publisher's efforts only get better with time, and when penning that review I was instilled with a sense of giddy anticipation for the the seemingly inevitable redux of the Street Fighter Alpha series. After all, that's the only major fighting franchise Capcom has yet to re-release, and the company has never been shy about rehashing Street Fighter titles. Unfortunately, it looks like we may never see Street Fighter Alpha on the Xbox Live Arcade. According to new comments from Capcom senior vice president Christian Svensson, the company is quickly losing interest in the idea of resurrecting its older fighters, primarily because they just don't bring in as much cash as they used to. "Sadly, I think we've probably run the course of feasible [classic fighting games] here given the droppoff [sic] we've seen in sales with each new introduction. It seems the novelty of such projects is wearing off even within just the fighting game community based upon the sales data of our last two launches," Svensson writes on the Capcom Unity forums. "That said, we have been quite prolific in these areas ... and it's probably time for us to slow down anyway." No! It's not at all time to slow down! You still have to re-release Street Fighter Alpha, then maybe Warzard/Red Earth, Cyberbots and ... Street Fighter EX? Okay, maybe Mr. Svensson has a point with his statement about how prolific Capcom has been in this vein. We've got awesome updates of Street Fighter III, Darkstalkers and the first two Marvel Vs Capcom games, so we should be happy with that. Still, it's sad to learn that profits have been falling off for these sorts of titles, even as they've been improving in quality with each subsequent release. Listen, if any of you decided to skip Darkstalkers Resurrection, despite being a fan of fighting games, I want you to re-read my review of the title, then fire up your console of choice and buy the game. 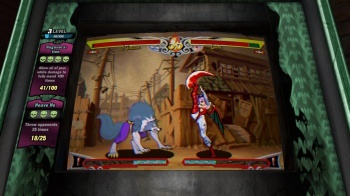 It's absolutely worth the price of admission, and Capcom should be rewarded for its meticulous attention to detail and genuine efforts to appeal to all Darkstalkers fans. Plus, I really want that HD remake of the Street Fighter Alpha games. My current-gen fighting game collection just doesn't feel complete without Ryu and Ken teaming up to fight M. Bison as the unfair, cheating jerks they truly are.